The Screw Conveyors offered by us are manufactured using mild steel and stainless steel, and are extensively used across diverse industries for successfully fulfilling variegated applications. These are highly demanded in the market due to their effective functionality, durable finish standards , strength, and are easily available in the market at industry leading prices. 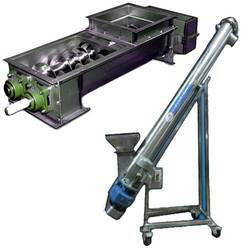 We are the leading manufacturer of screw conveyors in Hyderabad. Eqpt protect by zero speed switch fixed at Tail end. MS Screw Conveyor parts are built using a central shaft round which is wounded with helicoids flight. The function of screw conveyor parts depends on the size of pitch of flight. Capacity is proportional to the speed of rotation and the square of the diameter. 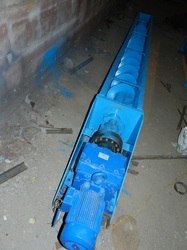 This screw conveyors machine comprises of a screw inside the hollow pipe, contained within tube and is turned with the help of a motor in order to deliver material from one end of the conveyors to the other. We manufacture screw conveyors with multiple inlet and discharge points. Our screw conveyor is best known for its easiness and dust free operations to treat powdered and granulated materials. Screw conveyor design helps in carrying the goods in an efficient manner saving time and labor. 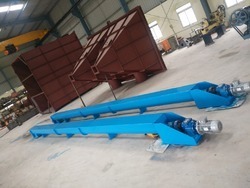 Screw conveyors in modern industry are often used horizontally or at a slight incline as an efficient way to move semi-solid materials, including food waste, wood chips, aggregates, cereal grains, animal feed, boiler ash, meat and bone meal, municipal solid waste, and many others. Screw conveyors has it’s application in chemical industry, all type of mixtures, ash handling, soda handling etc.